Welcome to Getting Out of Debt Joyfully! Join Simone Milasas at her home on the Sunshine Coast, Australia for a full day of facilitation and discussion to create a brand new financial reality. Simone answers questions, introduces new tools and processes to use, and shares her experiences for the creation of joy, wealth and happiness. What is Getting Out of Debt Joyfully - Create a New Financial Reality? No-one needs to have a money problem- especially you! You have an unlimited (and mostly un-accessed) capacity to create a financial reality that would work for you. What if money is not what you have bought, been told, sold or taught that it is? What if you can create money in ways no one else can? 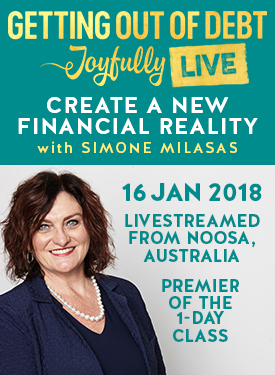 This unique full-day event was live-streamed from Simone Milasas's home on the Sunshine Coast in Australia and brings you tools and processes to create a totally new and amazing financial reality. Listen as she facilitates, questions, and shares the tools that empowered her to change her $187,000 of debt in just 2 years into a life of creation, joy, and wealth. IF. . . you choose it. Are you in?